On December 12, 2016, Michelle Ingall was on holiday in Playa del Carmen, Mexico, about as far from the ski slopes as one can get both in terms of geography and state of mind. However, Michelle and her CSP training made a critical lifesaving difference that day. Michelle was among a group of onlookers when a vacationer was pulled from the ocean with no pulse and not breathing. Michelle’s quick actions in this situation – requesting the correct equipment, issuing a call for EMS, recognizing agonal breathing and knowing what to do, all contributed to the survival of the patient. An unconscious man being tossed around by the waves was pulled from the ocean. Seeing the commotion, Michelle ran to help. She found the man was without a pulse, was cold and his skin was blue. As her CSP training kicked in she quickly found herself at the patient’s head – and directing the overall rescue and resuscitation efforts. After clearing the patient’s airway, compressions were administered by one of the people who pulled him from the water, and Michelle maintained his airway, calling for a bag valve mask, oxygen, an AED and an ambulance. Everything arrived quickly and within a minute, the patient regained a pulse. The excellent training from the Canadian Ski Patrol taught Michelle to recognize agonal breathing, so when the patient displayed these signs, she was able to act accordingly, maintaining oxygen and artificial respiration with the bag valve mask. Not long after, two doctors from the resort arrived and Michelle assisted with the insertion of an intravenous line. Michelle’s CSP training contributed in other ways as she helped rescuers improvise. Her snow-specific training led her to the idea of pushing sand under one side of the backboard to allow the patient’s airway to drain. It was not snow, but it worked just as well. Within about 10 minutes, the patient began breathing effectively on his own and even regained consciousness by the time the paramedics arrived. Two days later, after he was released from the hospital, the patient and Michelle got to meet. His name is Jose Fernandez, and he was a new retiree visiting Mexico from Argentina. They met and hugged and cried on the same beach where disaster had very nearly struck just two days earlier. 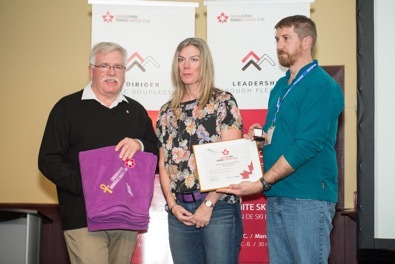 For her efforts and critical contributions in saving Mr. Fernandez’s life, Michelle Ingall was presented with the Canadian Ski Patrol Lifesaving Award at 2017 CSP Leadership Conference at Big White this past April. This entry was posted in Public, September 2017. Bookmark the permalink.